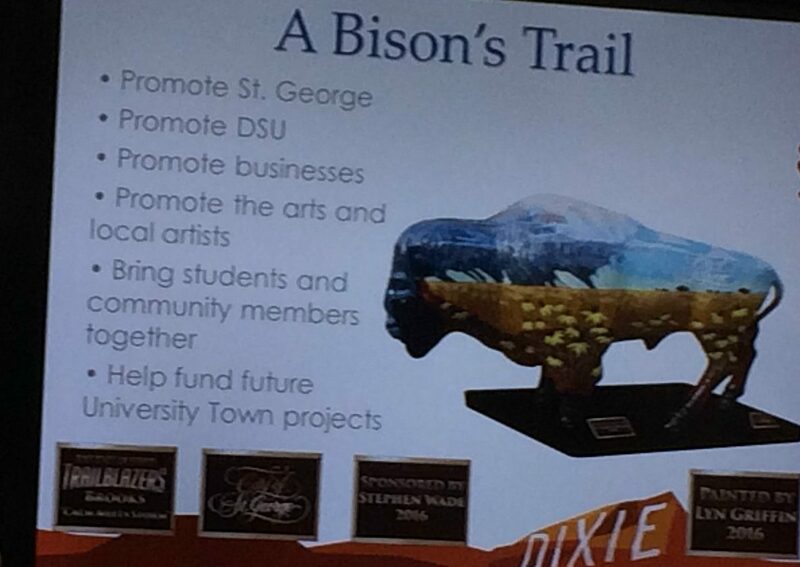 ST. GEORGE – Painted statues of Brooks the Bison, the new Dixie State University mascot, are likely to start appearing around town in the near future following the university’s announcement of its “Trailblazers Art in the City” program last week. The program was presented to the St. George City Council in June and met with unanimous approval. “Ever since we introduced the Trailblazer athletic identity in April, there has been a strong sense of support and enthusiasm on the Dixie State campus and throughout the southern Utah community,” DSU President Richard “Biff” Williams said. “We are thrilled to build on that excitement with the Dixie State University Trailblazers Art in the City project and create a thriving university town environment,” Williams added. The bison statues themselves are fiberglass constructs and start out like other canvas – white and naked until an artist works his or her magic on the bully bovine and gives it some color. The finished product is intended to show Dixie State’s vision of “encouraging excellence, cultivating creativity, and pioneering pathways,” while also representing the region and community. Susan Jarvis of Art Around the Corner, a group that aims to connect the community and local artists, said she has spoken to various artists about the Trailblazers Art in the City project. Thus far, the response has been quite positive. Artist applications are currently being accepted for the project. More information can be found in the Trailblazers Art in the City website. Drawing attention to the art installation, a mobile app and printed maps will be distributed to help visitors and residents alike locate all of the Trailblazer statues in the county. Businesses can also sponsor the project. 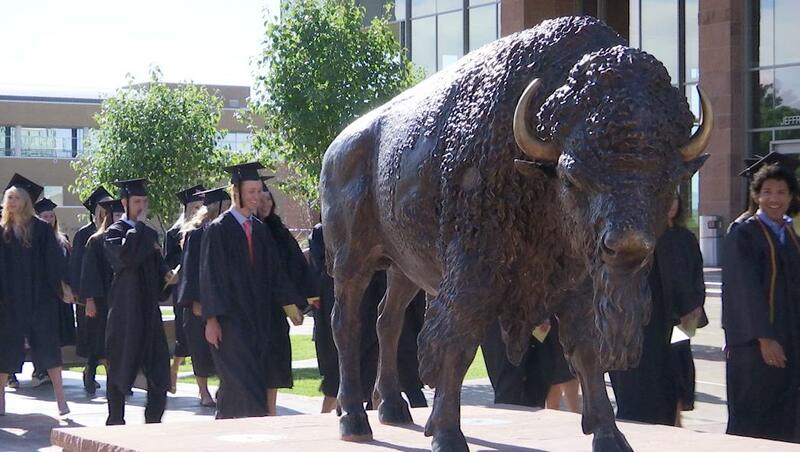 A business can sponsor one of the painted bison – known as an “Annual Trailblazer” – for a year for $5,000 and have its name on the statue. Potential high-traffic locations in St. George include the center of roundabouts, Ancestor Square, the Zion Outlets, Dixie Regional Medical Center, Vernon Worthen Park, Town Square and The Pioneer Center for the Arts, along with other public parks and areas and private businesses. A business can also purchase a statue outright – a “Purchased Trailblazer” – for a one-time commitment of $10,000. That bison will be a custom painted and placed in front of the purchasing business. All sponsors will receive recognition on the Trailblazers Art in the City website and the walking map and app. Sponsorship opportunities will begin at the Athletic Excellence Dinner and Auction Wednesday at 5 p.m. at the Burns Arena. Tickets are $125 per person. An Annual Trailblazer will be available at the live auction, and a Purchased Trailblazer will be available in the silent auction. During the initial presentation of the program to the City Council in June, Jordon Sharp, Dixie State’s chief of marketing and communications officer, said funds raised from the Trailblazers Art in the City program are anticipated to help with the university’s “towns and gowns” projects. Town and gown projects were described as ventures made between a university and the city it resides in that promote and benefit both. One example of a way money from a Trailblazers Art in the City sponsorship could be used is to replace the Dixie State banners on St. George Boulevard when needed or aid the city with branding efforts. For more information or to purchase tickets for the Athletic Excellence Dinner and Auction, contact Derek Dawes at [email protected] or 435-879-4295. To learn more about Dixie State University Trailblazers Art in the City, contact DSU’s Marketing & Communications Department at 435-879-4409 or [email protected] or visit the Trailblazer Art in the City website. Did bison ever even roam the plains of Washington county?